Posted: Wed Mar 30, 2016 1:42 am Post subject: Another one follows me home. 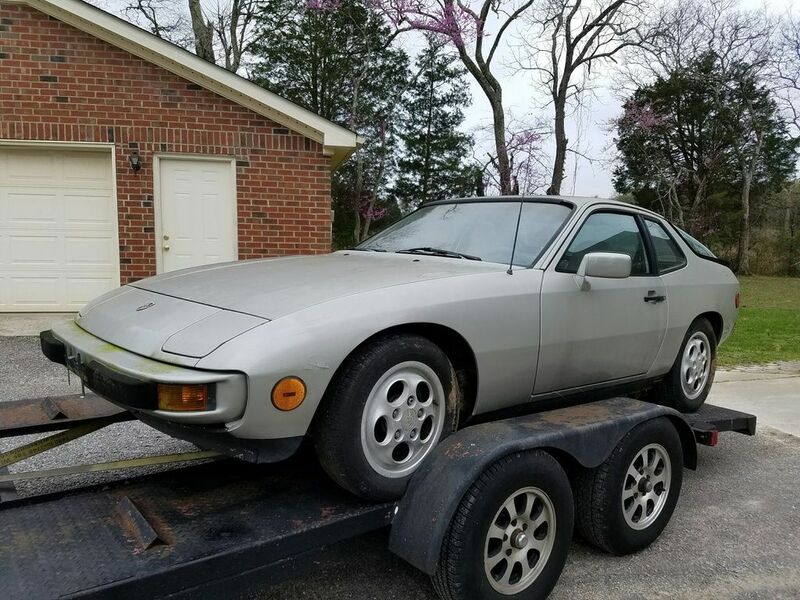 '87 924S, 80,000 miles (? ), limited service records, needs clutch master cylinder, fuel line off tank. MAACO paint job with some subsequent body damage. 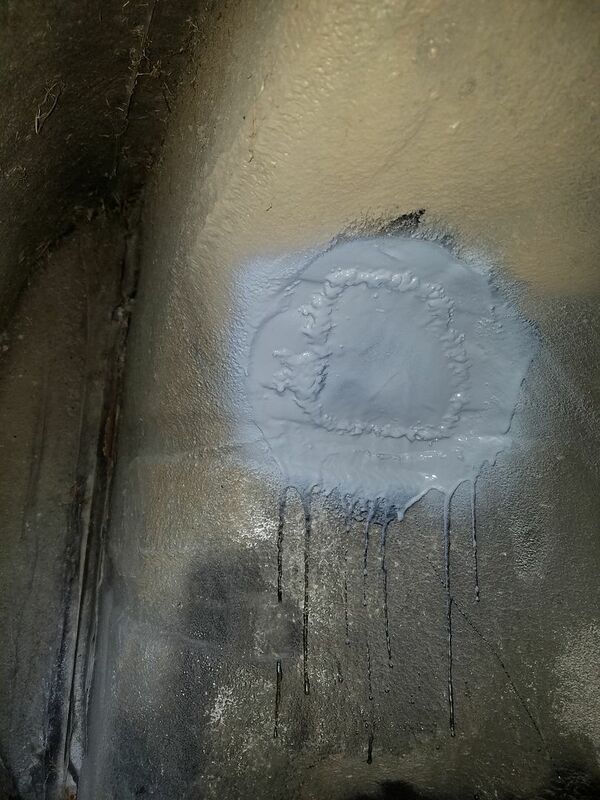 Bad seal on hatch and water in floor board. The motor cranks and reference sensor pulses. Seller was asking $1200 and settled for $800. Nice score! What do you have in store for it? Awesome... 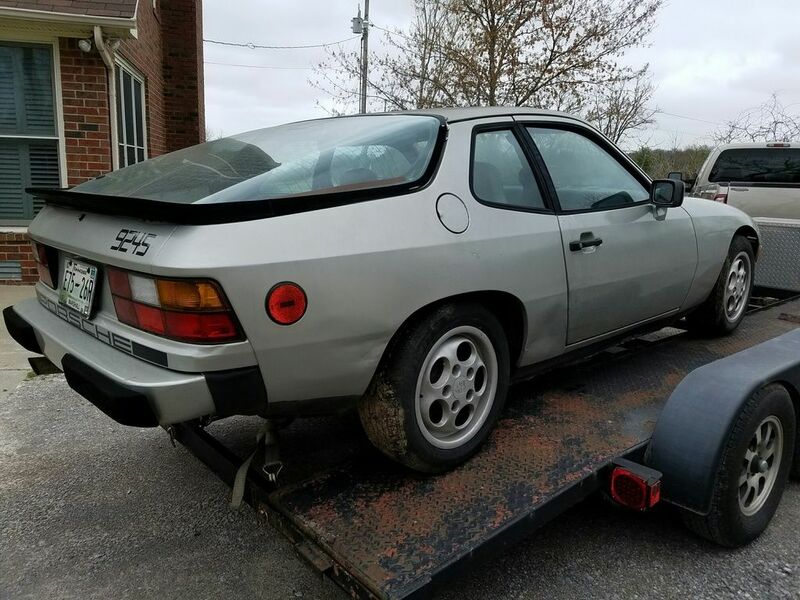 I knew you'd find a way to get modern fuel injection on your 924! Nah, not for the 931, I just meant the S.
The floor pan on this one was really wet. Passenger side mostly. The seat rails were rusty so it took quite a bit of PB Blaster to get them to break loose so I could remove the bolts. 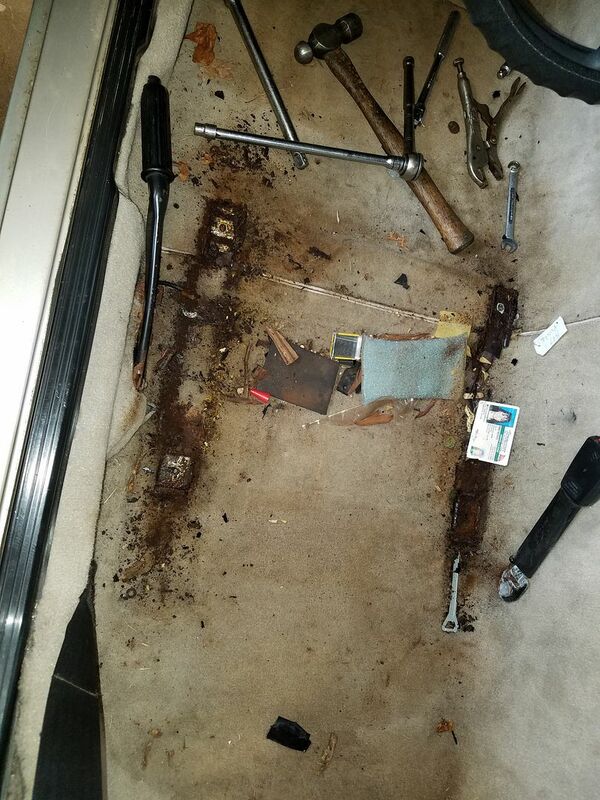 You just never know what you'll find under those seats. A PO must have lost her drivers license some years back. 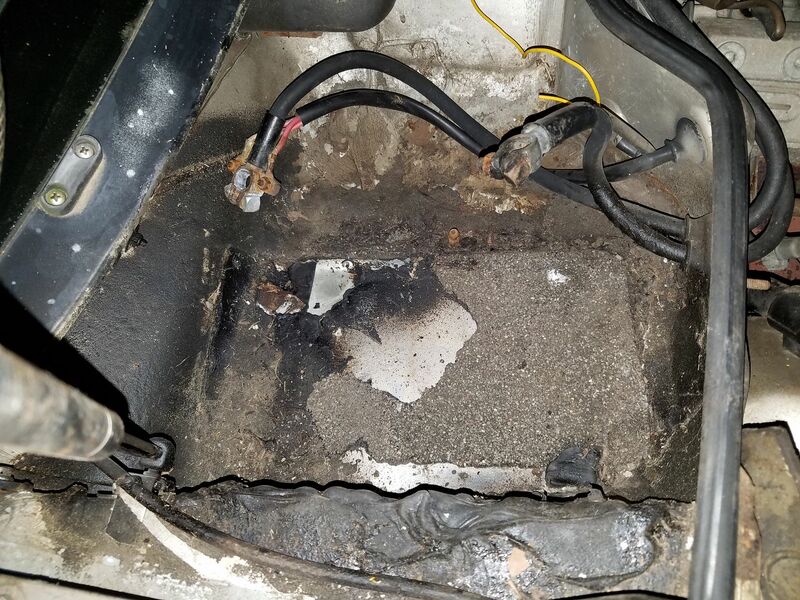 I got the rear carpet completely out, trashed the under layment and dried with heat gun. I'll let it sit open for about a week and everything should be dry. Also did some vacuuming in the engine bay. Took a peek at the timing belt - it will need replacement before I try to start the engine. Posted: Sun Apr 10, 2016 12:34 am Post subject: It's alive! Nice day off yesterday in the garage. Changed the timing, balance and PS belts. That process took about 3 hours. Found some walnut shells in the air box when I removed that. Put on the fuel hose that the PO hadn't from the tank to pump. Put in a few gallons fuel, started cranking and it fired up within a minute! Oil pressure came up good. The exhaust blew out a lot of moisture in the pipes. The lifters were noisy until the oil warmed up good and then quieted down. The cooling fans kicked in at just the right temp. I discovered that the radiator and AC coil are loose due to front end damage. One og the brackets was bent back so I removed the grill and lower valance to straighten stuff out. That lower valance is a mess so I might look into finding a replacement (grill also). I'm really pleased that this one is running great after just spending $80 on belts. Looks like a hydraulic flush may be in order as well. Thanks. This won't be an in-dept thread like I've kept in the past. In fact, I'm not sure where this car is headed. All I know is that it wouldn't have lasted in good shape much longer out in that field. 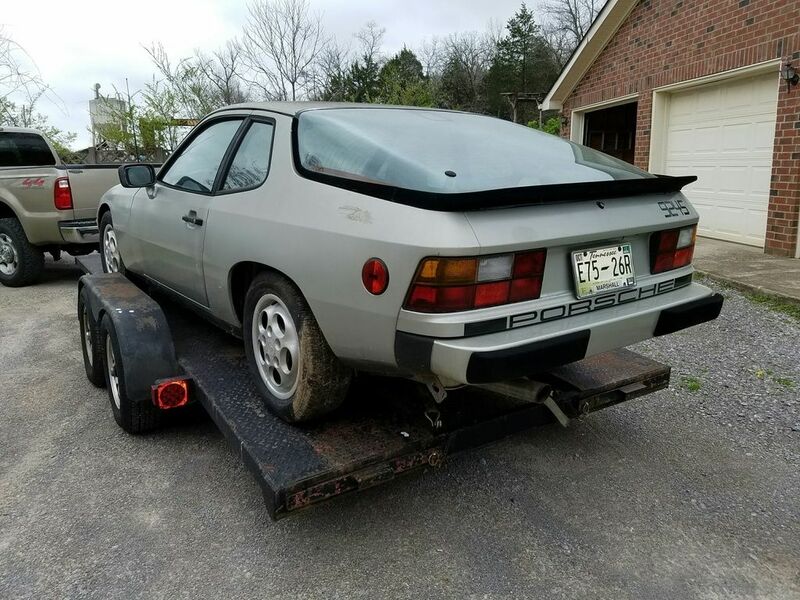 The middle Tennessee area is really good for finding neglected Porsches for great prices. Once owners understand the market prices and cost of rehabilitation, you generally can get them to face the reality. 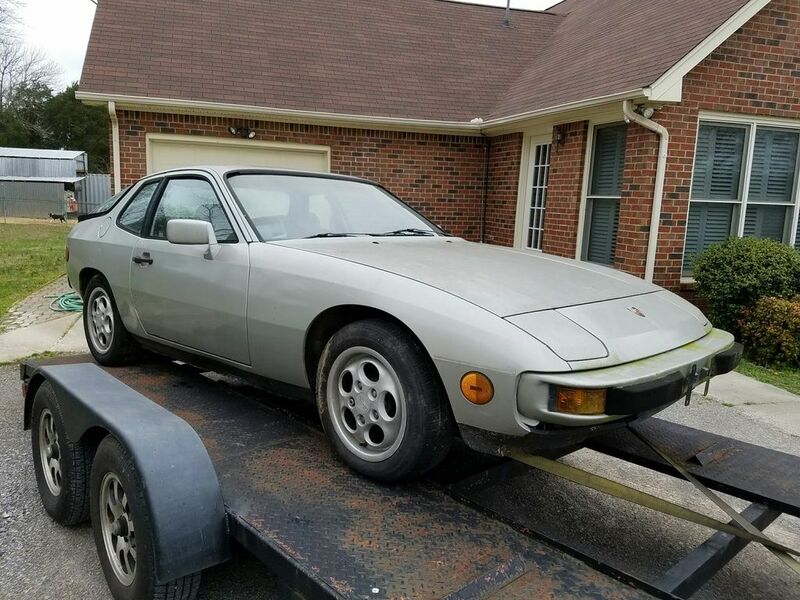 I'm seeing more 924s, 944s and 951s on Craiglist. Less 914s though. If those have been left in fields for decades, there's not much left. 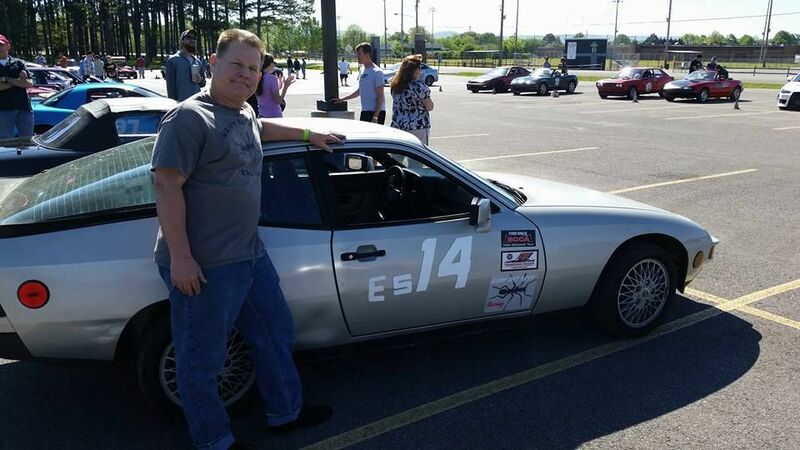 Yesterday I took this 924S down to Huntsville and did 5 laps autocross. I found out a few things. The suspension is loose and it handles like a pig. 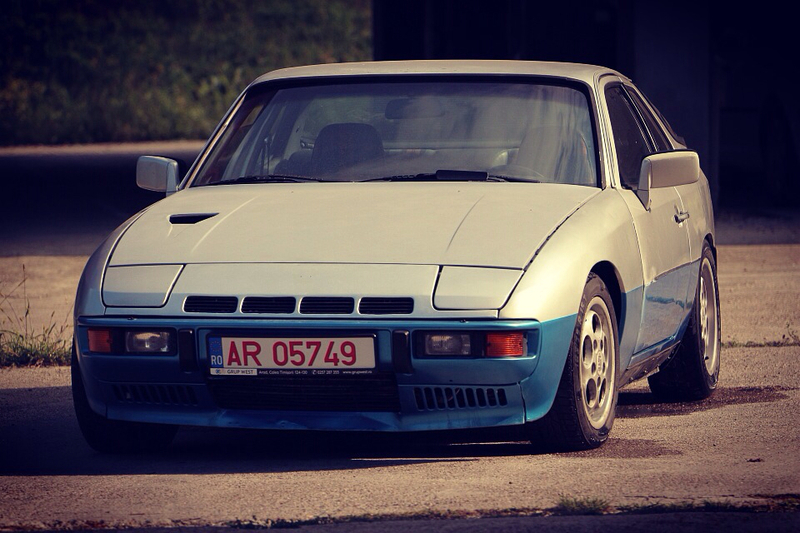 I put on the wheels from the '82 931 with Hankook RS-3 and that helped a lot. The engine performed well, the transmission is good and the clutch doesn't slip. Half way through the heat, I check the PS reservoir and it was empty. When I got back to my garage and put some ATF in, it promptly leaked out the rack (good thing I didn't re-fill in paddock). Last couple of runs the engine began to cut out. I'm attributing that to junk in the fuel tank and I've got a fuel filter on order. I also ordered a reproduction intake boot as the on it is held together with electrical tape. So after the autocross I decided to see if the power steering rack was functional. 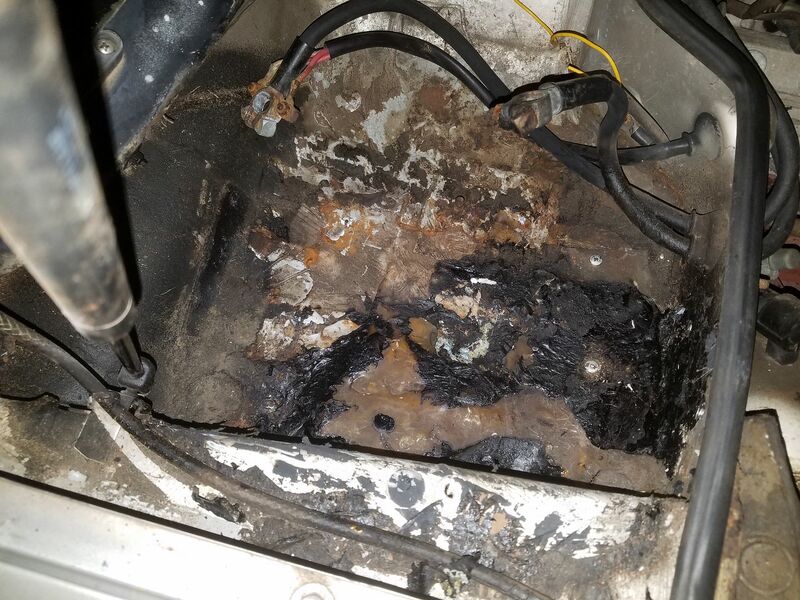 Started the car up, added about 1/2 quart to the reservoir and it promptly leaked out. Okay... So then I investigated the electrical some. The turn indicators are completely non-functional as are the emergency flashers. I had noticed that there were some toasty wires in the rear harness so I sorted those out and spliced in some good wire. Still no blinkers. Then I switched the known good turn indicator relay from my '82 into the '87. No dice either. Fuses are good. I was messing around with the turn switch and I believe that's the problem. In fact the wipers wouldn't work either. So I pulled the wiper motor, opened up the gear box and motor, and both are full of crud. I cleaned all that up, re-assembled and bench tested - it's noisy as hell but it works. After I re-installed the wiper motor it's apparent that the switch is no good as it changes speeds but doesn't cut off. I'm looking for a good turn indicator and wiper switch assembly. 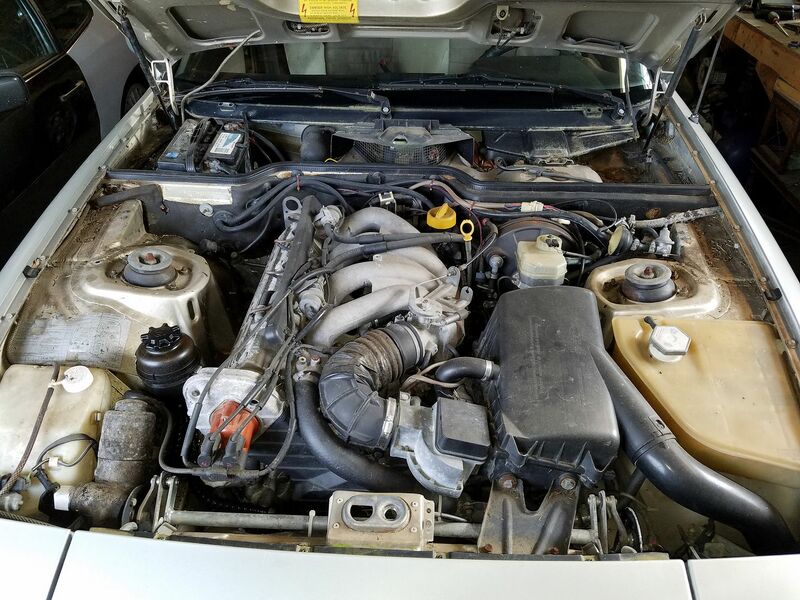 I found a junked '87 924S at a salvage yard and went to look at it. It's got terrible front end damage but the steering rack looked good and the brake calipers appear to have been recently rebuilt. So I cut a deal for the rack $50 and $25 each on the calipers (one caliper missing). I got those parts home and started in on the steering rack. 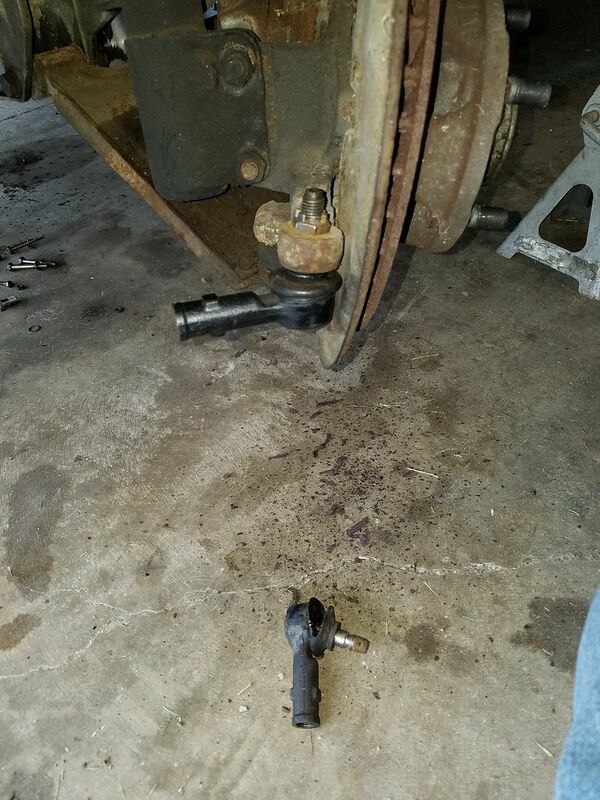 I figured out that you don't have to pop out the tie rod ball joints - just screw the tie rod out. The salvage rack had one bent rod so I swoped those from the original. That salvage rack was definitely a re-build by looking at the tag. I had to get one new boot from O'Reilly's to go with the one good one out of four. I took a chance on the hoses and put everything back together, dumped in some fluid but the return hose is leaking bad. Both the original hose and the one off the salvage rack are cracked at the 180 bend. So I've got a new return hose on order along with replacement front sway bar bushing as the originals were soaked in ATF, swollen and cracked. 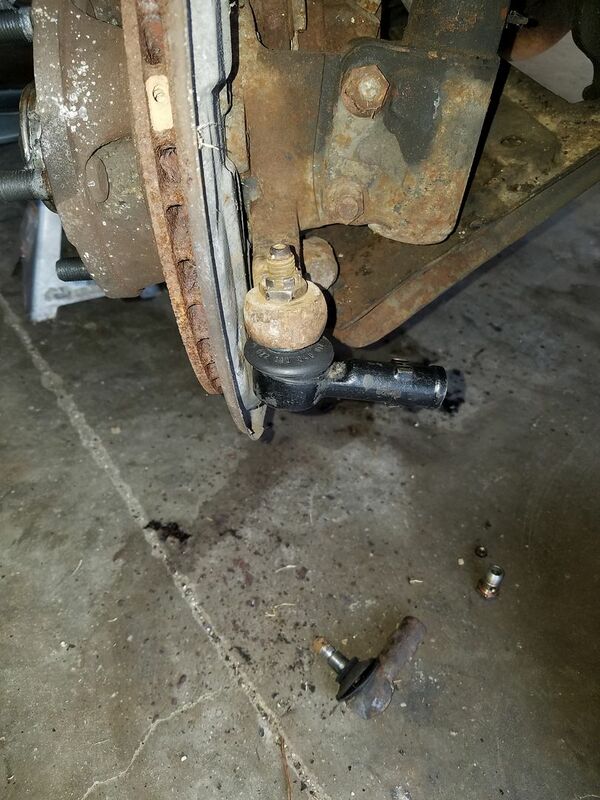 I did notice that the tie rod ball joints from the salvage rack are fairly new so I'll replace those on the '87 as well. 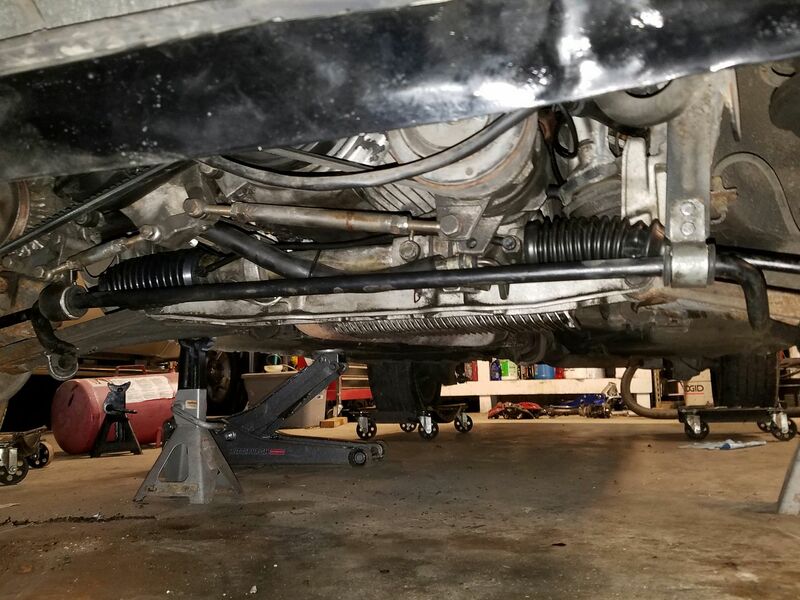 Last week I got the power steering return hose on, the salvage steering rack back in and front sway bar on. I ordered the parts from NewParts.com and they're usually really good but the inner front sway bar bushing were not the correct size. The outer dimension didn't fill the drop bracket. 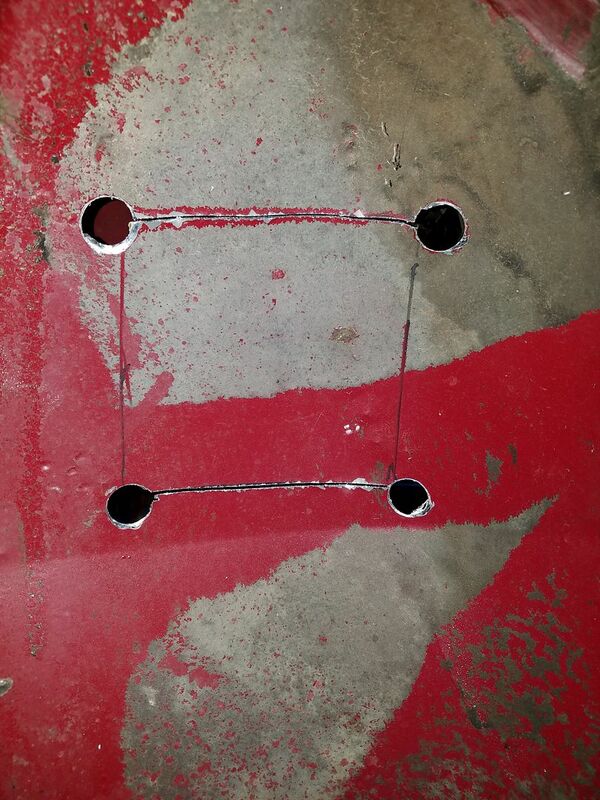 So I fabricated some spacers from PVC pipe to tighten that up. The good news is the power steering is good with no seen leaks. Later I moved to the interior. The carpet have stains that aren't going away so I purchased a can of interior paint (yes, it can be used on carpet) in sand brown. The only other color choice they had that made since was white and I figured the light brown would cover the stains better. Out come the seats, vacuum the carpets again and then mask off the surrounding vinyl. I did the passenger side first and it was looking better. As I'm vacuuming, I noticed rust flakes below the AC unit. Well we all know what that's from. I pulled the battery out of the tray and there's been some patching done there. Looks like a coating of roofing tar with a roofing shingle on top (just when I thought I'd seen it all). 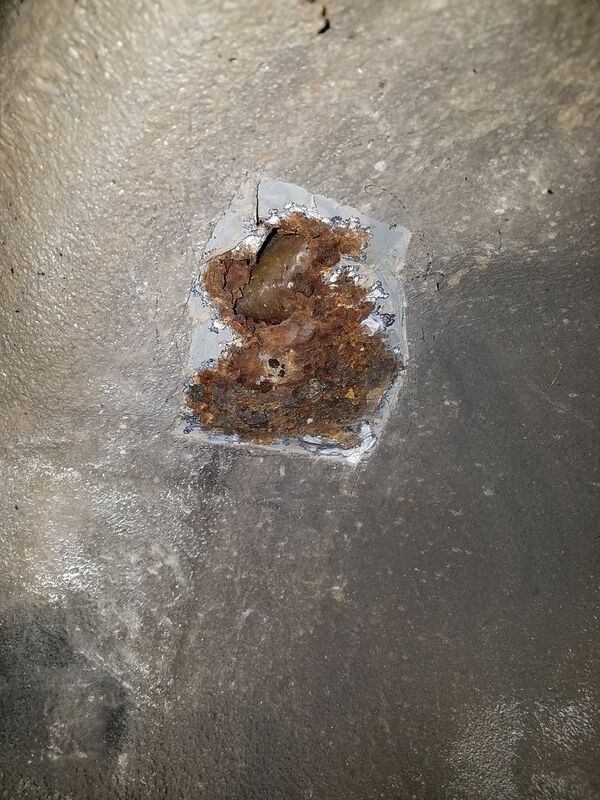 So I rooted out that mess and there's two layers of flashing sheet metal below anchored with pop rivets. Dug that out and there's another layer of fiberglass. So I'm thinking, leave the fiberglass and add more with the cloth and resin (more like I did on the 931). Then I found where rust is starting come through the wheel wheel below the tray. I stripped back the rubber coating and there's about a 5' square of rusty metal. That's got to be fixed properly or more water is going to invade. 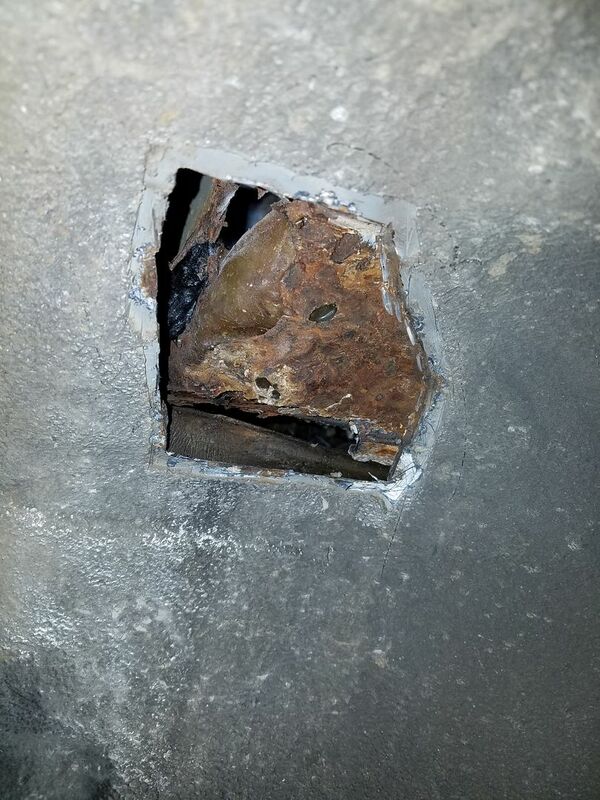 So I cut back that rust to solid metal, took measurements and cut a section from the wheel well on my 914 parts car. 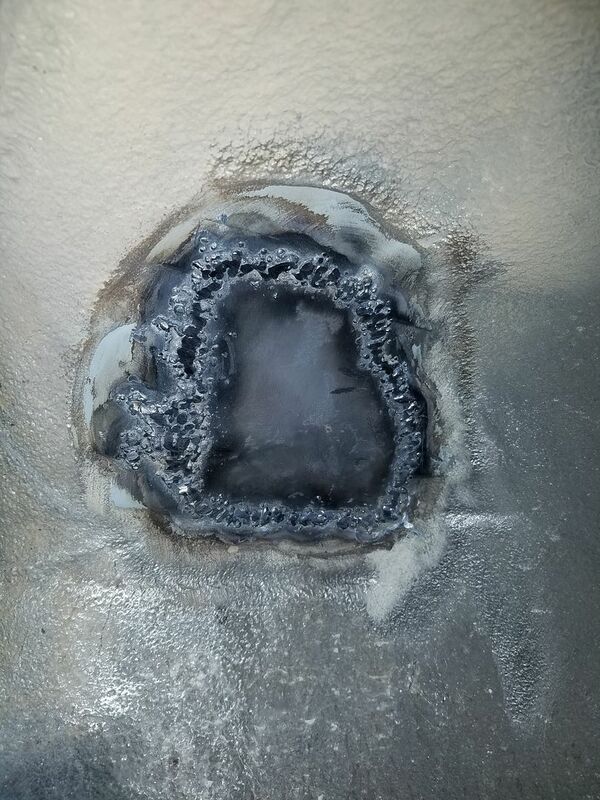 Cleaned that section up, cut to fit, sprayed the back side with weld-through prime and welded in. When I mixed up the resin for the battery tray, I also coated that patch in the wheel well and painted with primer. I finished the weekend's work on that car by painting the drivers side carpet. Oh, I also was able to get all the exterior lights (except markers) working. Went for a drive several nights ago to see if the new fuel filter fixed the stumbling and that started again after about 15 min. driving. So I pulled off the fuel line at the tank and ran 5 gal. 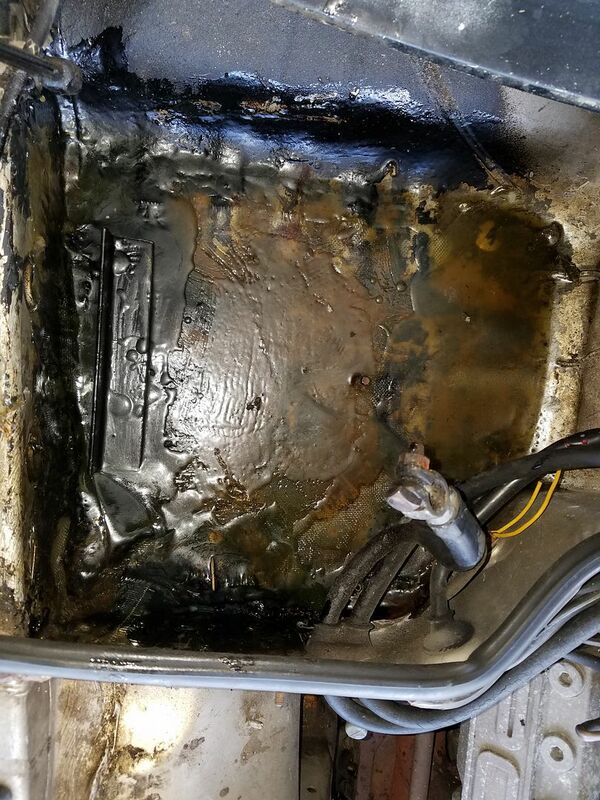 of fuel through it several times into a catch pan. Keeping an eye on the junk and rust. Not terribly bad but more could be residing in the tank. Then I back flushed the filter and put the lines back on to test drive. Same results. I suspect the injectors are clogging. I'll pull them this weekend and have a look. Still waiting on the replacement wiper motor and stalks.